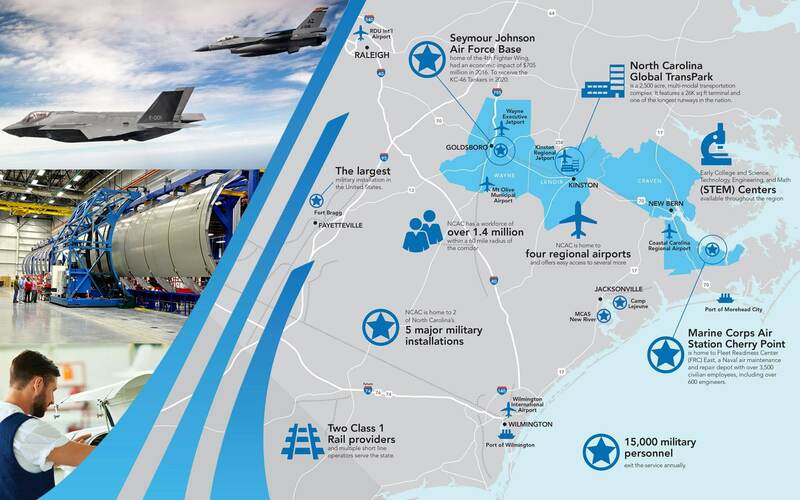 The North Carolina Aerospace Corridor exists to establish Wayne, Lenoir and Craven counties in Southeastern North Carolina as a world-class aerospace and aviation corridor, and to promote the region’s common assets to take advantage of opportunities for growth in the corridor. The region is anchored by the North Carolina Global TransPark, a multi-modal transportation and industrial complex designed to meet the present and emerging needs of domestic and global commerce. The NCAC is also centrally located on the eastern seaboard of the United States and offers unparalleled access to air, rail, highways and North Carolina’s two international ports, and provides convenient access to the region’s four major military bases. 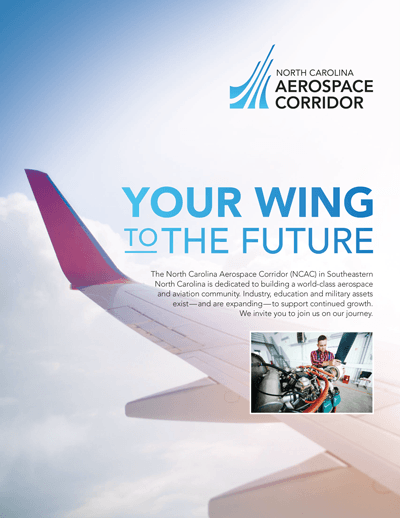 The North Carolina Aerospace Corridor has an aggressive economic development model in place and has found great success utilizing this model while transitioning from tobacco and textile industry clusters to aerospace, food, housing, biotech and pharmaceutical. The North Carolina Aerospace Corridor’s central location provides one-day trucking service to major metropolitan markets, such as Atlanta, Baltimore, New York and Philadelphia. Two-day motor freight services reaches deep into the Northeast, Midwest and Southeast, connecting the North Carolina Aerospace Corridor with target cities like Boston, Miami, Chicago and Pittsburgh. Runs east and west through the heart of the region connecting major Eastern Region cities including Morehead City, New Bern, Kinston and Goldsboro. Continues west through the Raleigh-Durham area and is a connector to both I-40 and I-95. Recently designated as future I-42. A major east-west Interstate only 39 miles from the Global TransPark that borders the region on the southwest. I-40 connects the region with Wilmington, Raleigh-Durham, Greensboro and extends west to Barstow, California. A major north-south Interstate only 47 miles from the Global TransPark that borders the region on the west. I-95 connects the region with the south to Florida and with the north to Maine. It is considered one of the most important travel routes on the East Coast of the US. 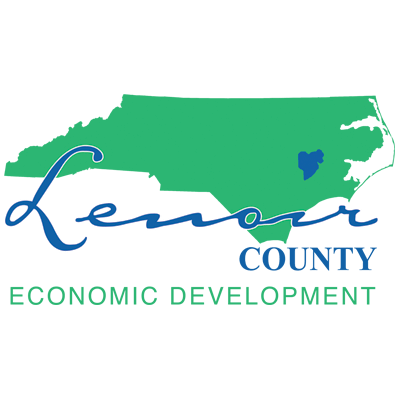 The NC GTP is a 2,500 acre, multi-modal industrial park with a pro-business climate aimed at growing aerospace, logistics, manufacturing, emergency services and defense contracting industries. Located just 3 miles from Kinston, the GTP features a 26,000 sqft terminal and one of the longest runways east of the Mississippi. Supports air carrier charter, air transit charter, military operations, general aviation, cargo operations and flight school training. Named as one of the 10 outstanding logistics parks in the South by Southern Business & Development. Designated as Foreign Trade Zone 214. 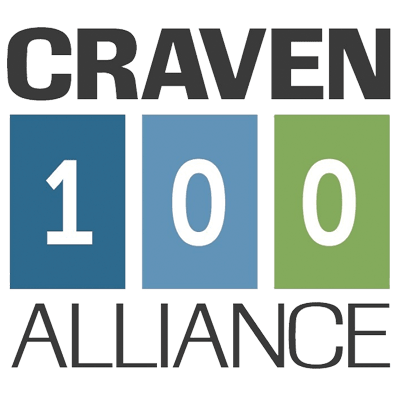 Located in Craven County, just 3 miles southeast of New Bern. Passenger service offered by American Airlines and Delta Air Lines. Located in Wake County. Passenger service offered by 14 air lines, with more than 120 daily departures including nonstop intercontinental service to London and Paris. Class-One railroad system with 1,200 miles of track serving the Port of Morehead City and surrounding areas, with a rail network extending throughout North Carolina. 1,800 miles of track serving the Port of Wilmington and extending throughout North Carolina. Recently invested $47.9 million in its NC network. One of the deepest breakbulk and bulk facilities on the US East Coast, 4 miles from the Atlantic Ocean. Within 700 miles of more than 70% of the US industrial base. Designated Foreign Trade Zone 214. One of the few Southern ports with readily available berths and storage areas for containers and cargo. Offers terminal facilities serving container, bulk, breakbulk, cold storage and ro-ro operations. Equipped with four post-Panamax container cranes and the latest in cargo management technology. Designated Foreign Trade Zone 214. Home of the 4th Fighter Wing, the 916th Air Refueling Wing and the 414th Fighter Group. 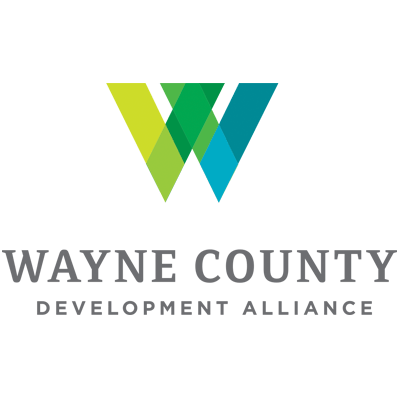 Encompasses more than 3,000 acres in Wayne County and employs a military force of nearly 7,000 strong. Home to Fleet Readiness Center (FRC) East, a Naval air maintenance and repair depot with over 3,500 civilian employees, including over 600 engineers. Thank you for your interest in the North Carolina Aerospace Corridor – your convenient point of access to relocate or expand your business. We appreciate the opportunity to have a confidential conversation regarding the assistance we can provide. Call us at (910) 862-8511, email us, or complete the form below. Copyright © 2018, North Carolina Aerospace Corridor. All Rights Reserved. Website by Edge360 Creative.